I’ve been a stay-at-home-mom for 12 years! 12 years! Wow! I love being home with my kids, but it’s not always easy and anyone who says it is, well, they are lying! If you’ve followed my blog for a while, you know I’m a true entrepreneur at heart – I’m always trying to think of ways to make money in my everyday life. I’m so thankful I get the pleasure (although like I said, it’s not always a pleasure) of being at home with my kids and taking care of our household. But, let’s be honest, being at home all day taking care of laundry and kids doesn’t pay the bills. extra jobs for the first 5 years of our marriage to pay off all our debt and that sure made it easier for me to be home not working. 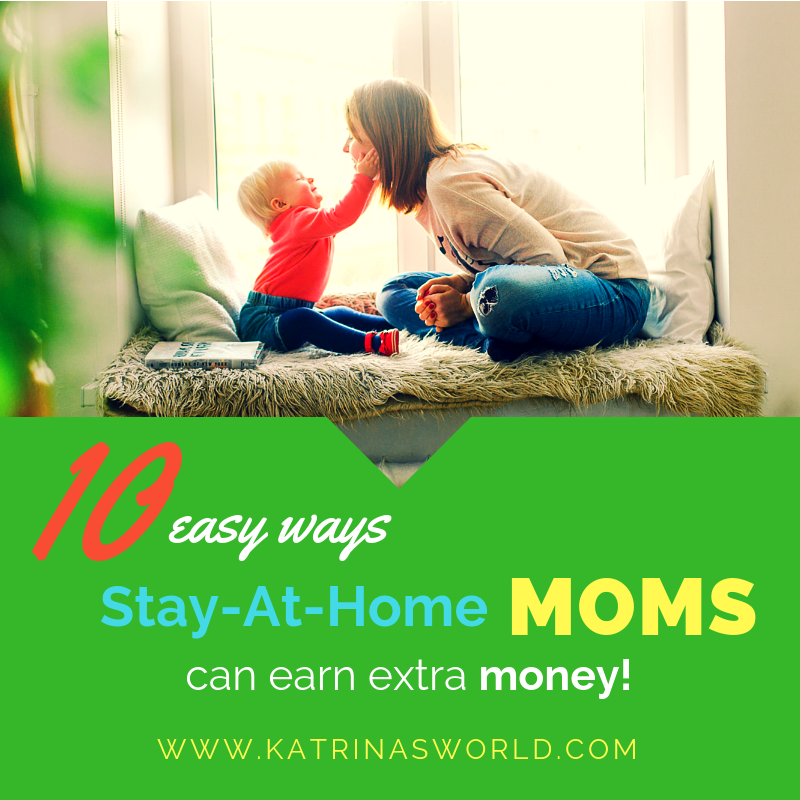 Nannying is an excellent way to bring in extra income while staying at home. The best part of nannying is that it goes right along with what you already do as a stay-at-home-mom, especially if you are able to nanny a child around the same age as your own kids. Plus, having another child around to play with your child is also a bonus! I nannied a little girl last year for the duration of the school year. She was with me 3-4 days a week and she fit right into our daily schedule of kid activities. Plus, my kids loved having her around the house and always wanted to play with her. I have been making my own all-purpose cleaner for years and recently while sitting at church I had a bright idea that I should bottle it and sell it for all the people who just don’t have time to make it themselves. It’s called CLEAN MOM Homemade All-Purpose Cleaner. Plus because I’m making it myself, it’s pure, natural and has no harsh chemicals. If you have a product you can make and sell, go for it! 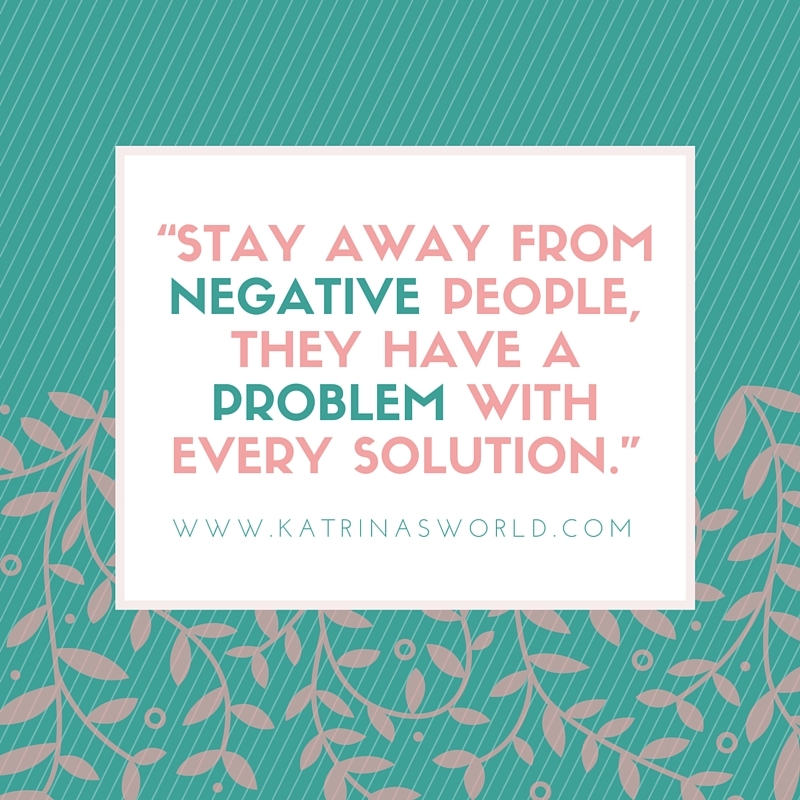 I’ve chosen to advertise my cleaner on a local Facebook page dedicated to Homemade products, as well as my own Facebook page, my Katrina’s World facebook page and my Katrina’s World blog. The sky is the limit on where you can post your products to sell them. Use local online pages, or consider setting up a booth a local Farmer’s Market or craft show on a weekend to display and sell your products. If you know any business owners with a storefront, consider approaching them about possibly setting up a little point-of-sale spot in their business. I’m working on this now! 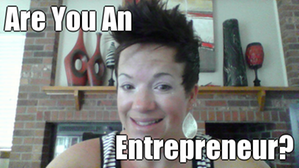 I’ve had my blog for about 4 years now and it’s never made a single dime of income for me. I’ve taken it very slow, built it from scratch, spent countless hours pouring my heart into my posts, and have loved it. I take a lot of breaks from my blog to focus on other things especially when life just get really stressful. For me, that’s ok. I never started my blog to be popular – I really don’t know why God lead me to start my blog…I still wonder. 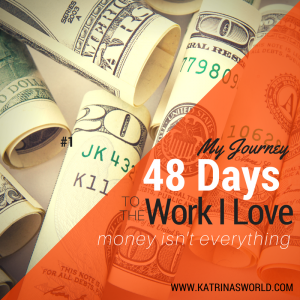 I can tell you this, I like working on it, it’s a lot of work, but I know from all the other blogs out there that I follow that you CAN make money with your blog. I would love for my blog to make a real income for our family – even just a little bit would be helpful, but it’s all in God’s time and I’m willing to go along for the ride. Most of the money made on blogs comes from advertising income, guest posts, sponsored posts, etc. It all comes down to page views on your site and how many people are active on your blog. I’m currently working on that aspect right now. The sky is the limit on the work-at-home jobs that are out there, you just have to get creative on where to find them. A few of them that I have done are: Data Entry, Virtual Assistant, Lead Processor, Appointment Scheduler, and Research Assistant. When I really think about it, most of these jobs have just come along when I’ve been in the right place at the right time. I never really went out looking for them. I did some data entry – but I did struggle with this, as I’m not good with numbers. I’ve been a virtual assistant many times over the years, but mostly for friends. I also recently spent a few months doing some lead processing which tied right in with appointment scheduling for a local doctor and loved the job! It was simple to do, didn’t take very much time, and made great money! I got paid every time I called a lead and got them scheduled for an appointment. If they showed up to their appointment, I was paid. It was a perfect job to do at at home, I just needed a phone and my computer. Again, this was another job I did that found me. I really liked it, much more than I thought would and hope to do it again soon! For work-at-home jobs, sometimes you just need to jump on Facebook and tell your friends and family that you are looking for something you can do from home and then list off all your skills and see what comes back to you! I’ve done lots of freelance design jobs over the years. Since I have a degree in graphic design, all my work 20 years ago centered around design. I worked full-time doing design for other people and then for my own business for many years! When I stepped away from my design business I still would do all sorts of freelance design jobs on the side for different people. I still do – especially for close friends and family and a few local doctor offices. If you are able to do any type of freelance work, it’s a great way to make extra money. I have friends who code apps, space plan, or stage houses – the sky is the limit for what type of freelance work you can do! Join a network marketing company or multi-level marketing company. There are so many of them out there – find something you are passionate about like lipstick, makeup, health products, vitamins, candles, essential oils, etc. Instead of just consuming the products, sign up as a consultant and sell the products to your friends and family and then you can earn what you consume for free usually! It’s a win-win! I’ve had my own network marketing company and boy does it come with it’s ups and downs – be ready for a LOT of rejection, and a lot of triumph! I’ll be honest, it just wasn’t for me – but that’s a whole other post to write some day! There are 2 ways to do this – if you have a 4 year degree you can teach in many different ways – Community College, Substitute Teaching, Online Classes to foreign kids (and I’m sure there are many more). A long time ago, before we had kids, I was working full-time as a graphic designer and we had just finished Dave Ramsey’s Financial Peace University course and we were committed to get out of debt as soon as possible. We both worked extra jobs and for a while I started teaching at our local community college. I taught basic graphic design classes at night and it was hard! The workload was a lot because I taught 2 classes a week , but it was so worth it! We made some great extra money and payed off all our debt in one year! I’ve never done substitute teaching or online teaching, but I’ve considered it. I have quite a few friends who teach online classes to Chinese kids and they love it! I’m not a fan of the hours though – it’s typically an early morning job – which is one reason I’ve not wanted to give this a try. I’ve also never tried substitute teaching at any of my local schools, but have considered it as well! I love to speak to large groups! If you are passionate about a topic, find a way to brush up on your speaking skills and share your knowledge with others! Join your local Chamber of Commerce and start out small by speaking for free to a small group. I used to speak about inexpensive ways to market your business with my local Chamber at a monthly luncheon and it was a great way to share my knowledge and also get my company name out there. I loved it and would love to do more speaking! I’ve also spoken at my local MOPS group about couponing, as well as how to raise kids with God’s grace. While I never made a lot of direct money from speaking – I did make money in other ways from it – such as I grew my graphic design business by gaining new clients by just putting myself out there and I also was given gift cards as payment for speaking for a my MOPS group. I don’t do this as much as I’d like to! I love dogs, especially mine, and I walk her ALL the time – usually about 6 miles a day broken up into 3-4 smaller walks. Sometimes I think she’s taking me for a walk more than I am walking her. I need some breaks all day long to stay focused and walking her is the perfect way to do it! She’s still a puppy and is FULL of energy, so walking her is a perfect way to give us both a break. I’m walking so much all the time, that I sure thought it would be nice to find a few other neighborhood dogs that needed walking as well and make some money getting exercise! I’m still open to this idea and hoping to find the right pups to walk! Have a bake sale with your kids on your front lawn! I do this with my kids every summer and it’s a blast! We bake up a whole bunch of treats and make a festive table in my front yard. We stick up signs around the neighborhood and viola! It’s great to pair a bake sale with a garage sale if you really feel like doing some work! Part of my recent silence has been a lot of contemplation, not only about my kids, but about me and where I’m going in my life. When I was senior in high school I had HUGE dreams – my life was all ahead of me, and I thought I would be something AMAZING! I dreamed of being a business owner that would make my first million dollars by the time I was 30 and then I planned to sell everything I owned, donate my million to my local church and go be a missionary in the poorest parts of Mexico. For real. Those were my dreams! At the ripe age of 18 I had to pick my future career, and for me, that was deciding what business I wanted to have that would make me my million dollars. I had been exposed to graphic design in my high school classes and won a bunch of awards, so I felt like that was what I was good at. I had also been exposed to business classes and truly loved them – I ran our school store and was the CEO of our school business department – that was my true passion, I just didn’t realize it. When I chose my college, I picked it because of scholarships I was given to attend, the warm location (I was tired of Colorado snow I guess), and because I wanted to attend a private Christian University. My plan was to double major in Business and Graphic Design, but was advised to pick just one and I had a bigger scholarship for art, so I chose Graphic Design. The problem was that my college did not have a good art department – it’s no wonder they gave me a big scholarship! My 18-year-old self didn’t think much of any of this and I just put my business degree on the back burner and went ahead with an art degree at a private, out-of-state school that cost a lot of money and left me with a huge pile of debt when I was done. If I could do it all again, I absolutely would have gone to a community college in my home state and went after a business degree instead of art. It would have a saved me a ton of money, and given me a much more well-rounded education that was geared more towards my true passion which is business – not art – but at the age of 18 I didn’t think that far down the road. My college years put me on a journey towards a career that now, almost 20 years later, I’m not longer interested in doing. Awesome. ☹ I think this is common for a lot of people, you think you want to do one thing, you pay a ton of money to go to college to do that one career and then realize that is not really your true passion. Seems like a very expensive way to learn that lesson, which is very frustrating at this time in my life. Two months before I graduated from college (a year early I might add – yes, I could’ve handled a double major for sure…but oh well), I got married! Wahoo!!! We began our first business shortly thereafter – a graphic and web design company and we built it from the ground up. We started it small, working at night and on the weekends with only one client at a time, and we made a deal to keep our business 100% debt free, so we knew it would grow slowly. After a few years of both of us working on our business just part-time while we both worked full-time, we made a huge leap of faith to move to Colorado and for me to quit my full-time job and work our business full-time. My husband was able to keep his full-time job and work remotely from our apartment in Denver, while I joined our local Chamber of Commerce and hit the pavement selling our business. It took time, but slowly it began to grow. After only living in Denver for a little while I was bringing in a lot of work and my husband was able to go part-time with his job and spend even more time on our business. Only 6 months later our business had grown so much much that my husband quit his job and began working for our business full-time! That was a huge leap of faith for us, and God totally honored it! A few years into our business we were making great money and we decided it was time to have some kids! By the time our 3rd child was born, I was burnt out! I couldn’t be business owner, full-time graphic designer, meet with clients and do all the sales while being a mom to 3 young children who were at home with us all day long. It was such a challenge to balance work when they were napping – especially when they got older and didn’t nap nearly as much! I realized one day when I was running my oldest son to Kindergarten and my middle child, who was super sick, had just thrown up in my car on the way school. At the same time my newborn was screaming his head off and my cell phone was ringing off the hook with a client who needed to talk to me – it was just too much, I just couldn’t do it all anymore! My priorities changed and I needed a break and felt like it was more important to just be a mom while the kids were young. The stress totally got to me and I wanted a time-out! 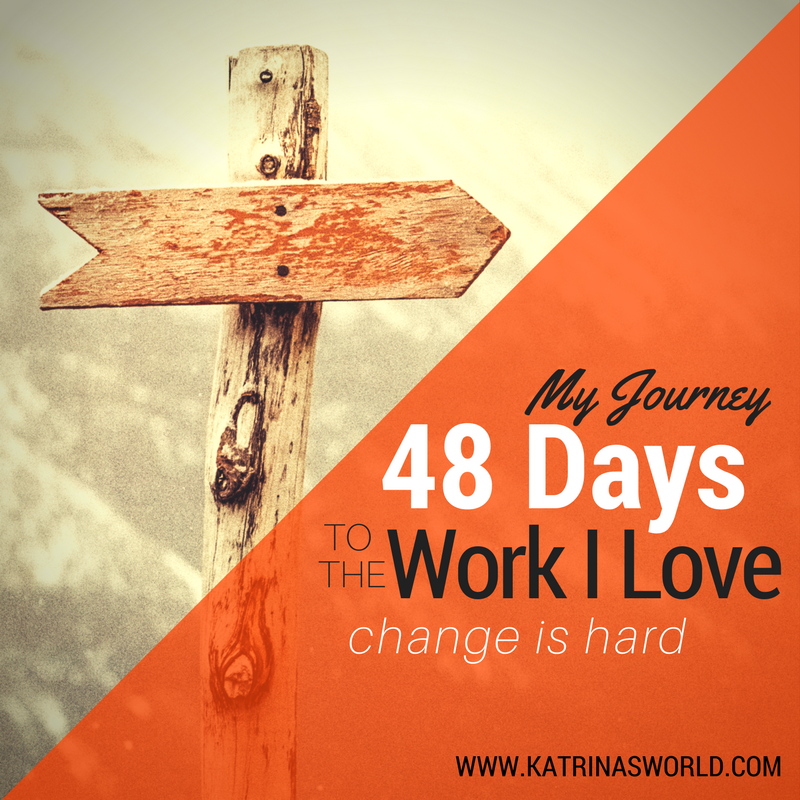 My husband was also burnt out from all the long hours and the stress of being a business owner. Because our oldest son was born with heart problems, we were having a hard time paying for our self-employment insurance – it was awful to know how much we had to pay for insurance just because we could not get on a group plan. It was time for a change and I was ready to walk away from the business, the long hours, and the constant phone calls. I was longing to breathe, play with kids, and not worry about clients. It was much harder for my husband to walk away from it – it was like the death of a dream – he felt like a failure. I, on the other hand was super proud of us! We did it! We started and successfully ran a thriving business that was our sole income for 7 years! I think I was ok to walk away from it all because I didn’t enjoy all aspects of my duties – I learned that I loved business, actual business – I like managing our employees, organizing our work flow, and meeting with all our clients, but I didn’t love doing the actual graphic design work. I’ve spent the last 11 years just being a mom – you know what I mean, carpooling, crafting, tons of cooking, gardening, more carpooling, coaching soccer teams, working with the kids at my church, starting a MOPS ministry, and lots of couponing. When my kids were babies, it was very fun and fulfilling – the days were long and busy and I didn’t have time to feel sorry for myself. Now that all 3 of my kids are in school, I have a lot more time to think and dream and find myself at a spot where I’m totally lost as to what my purpose is. I never planned or even thought about what my life would be like past starting a business and having kids. It’s a very weird place to be. I feel very unsure and lost about what I’m supposed to do next or what I even want to do next. 15 years ago, as a wedding present, we received Dave Ramsey’s Total Money Makeover 12-Week Course and it was the best thing that ever happened to us. From Dave Ramsey, we learned about Dan Miller and his book, 48 Day To The Work You Love. I’ve heard Dave advertise this book on his website for years and it never seemed to apply to my life until now. 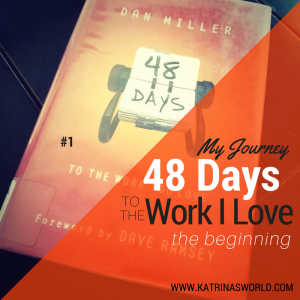 I checked out the book from the library and am going on a 48-day journey to try and figure out what is the work that I love! Join me on my journey and I’ll try to let you know what I come up with! So far, I wish I would’ve purchased the book because there are a ton of things I’d like to highlight and make notes about – it’s just that good! It’s hard to remember this when you are deep into relationships with people around you. 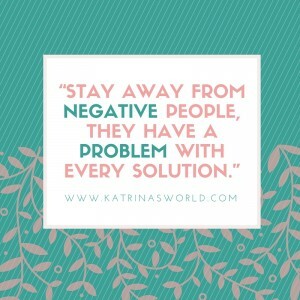 Sometimes you don’t realize just how much people around you influence you, but it’s so true that negative people have a problem with every solution. Make sure you stay aware of the people you surround yourself with. Keep pursuing your dreams! Are you worn out and exhausted and wondering why in the world you keep trying to make money with your side gig when it’s the millionth time that you have hosted a home meeting, brewed the coffee, baked the cookies, spent hours practicing your presentation, prepared handouts, creatively displayed your products, sent out tons of invites, received a long list of RSVP’s, only to have your phone ring over and over with cancellations 10 minutes before the meeting, and then no one shows up at all? Or here, let me set a different scene – have you spent hours and hours waking up super early each morning to work on your blog – day after day – you are writing for hours and hours and usually that is between a child or two that decide to get up early too? You write, photograph, design beautiful “pin-worthy” images for every blog post, create catchy slogans, read every book by the famous bloggers who have made it, go to blog conventions, rub shoulders with celebrity bloggers, all to have your latest blog giveaway of a free lunch only have 3 people comments (and it’s a FREE lunch people…free…and you still can’t even get people to enter). Both of these scenarios are in addition to everything else that is added on top of your regular daily jobs as a mom of cooking, cleaning, taking care of the kids, soccer practice, grocery shopping, school carpool, etc. – and somehow you are also trying to carve out time to be an entrepreneur and be successful because you have lofty dreams of one day being one of the celebrity bloggers you read devotedly each day, or one of the top level earners who just got a new car! Remember that being broke is a state of mind. 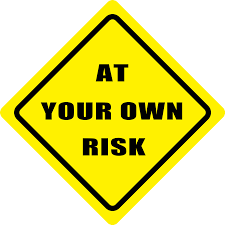 If you are an entrepreneur and already have a side gig, then you are leaps and bounds ahead of most people – broke people. Consistency is key – keep at it. Don’t give up. 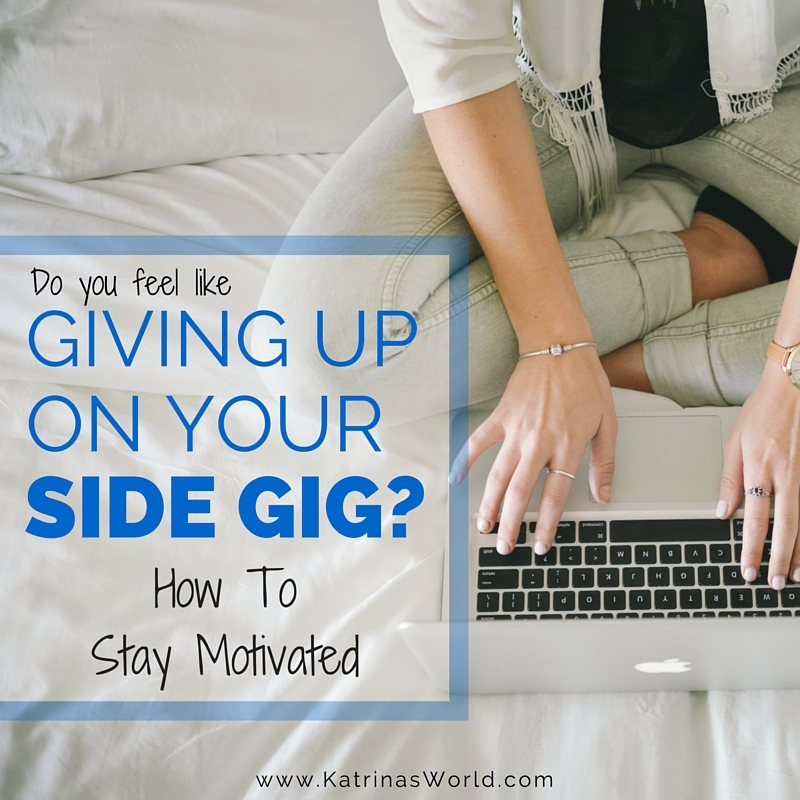 Hold on to the reason that you started your side gig to begin with. 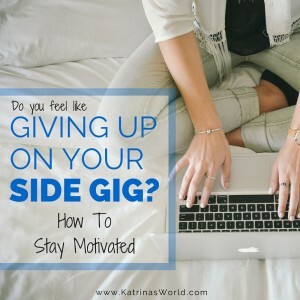 Identify your “why” and write it on a sticky note and paste it up on different places in your house to remind you of why you choose the struggle to have a side gig. If you don’t have a “why” then stop everything and identify it right now. Focus on it, and keep going. Surround yourself with people who encourage you to reach your goals – if they don’t get super excited when you are winning than they are not your friends. Your success is up to you. If you want to grow your business, it’s up to you – not anyone else. 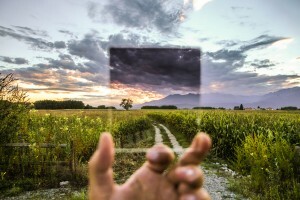 If you want your blog to be amazing, write amazing blog posts. If you want to take your business to the next level, then hustle and make it happen. And finally, moms, give yourself some grace. If you don’t get it all done in one day, that’s ok. Like they say, Rome wasn’t built in a day. Give yourself grace, go to bed, and get up and try again. Just don’t ever stop trying! We can do this together – plus I’m praying for you and would love you to pray for me too! Please feel free to send me an email with how I can be praying for you and your side gig! If you want to pray for me, please pray that God would direct my side gigs to be whatever He wants them to be and that I would humbly follow His direction. Hugs momma! Perspective is really hard for me. I’m terrible at envisioning the future. I’m not a “dreamer,” I dwell in the present and rather than looking forward to the future I have this awful way of digging up the past. For example, I love people and I have a God-given ability to meet and get to know people. God has given me a gift of being able to bring people together – I like to call it “I’ll introduce you to your next best friend.” I loathe this gift, but am trying very hard to find God’s blessing in it. Instead of being happy for the people I’m able to help and blessed by the time (no matter how short) I was able to enjoy with them, I end up feeling lonely and that a piece of my heart has been sacrificed on the altar of “friendship.” I’ve never understood this gift, but am praying for wisdom on how God intends me to use it. It’s all about perspective, which I’m still working on. I’ve spent a lot of time lately pondering what the Lord wants me to be doing at this time in my life. I’ve had a rough year and I realize now that it’s all been about my skewed perspective. I’ve spent a whole year beating myself up for all sorts of reasons, mostly my failures as a mom, wife, friend and business owner. And the longer I beat myself up, I felt so lost and frustrated, that I wanted to give up on everything. I was spending so much time dwelling on just how much I had failed rather than looking at just how much I had accomplished! Seriously why does one single failure out-weigh a hundred victories? And why do we keep score on ourselves anyway? Perspective. It’s all about perspective. 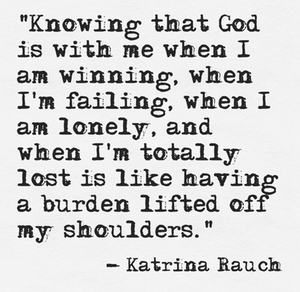 Then I came across an awesome quote, “God never sends you into a situation alone. He goes before you, He stands beside you, He walks behind you. Whatever your situation, be confident, God is with you!” Knowing that God is with me when I winning, when I’m failing, when I’m lonely, and when I’m totally lost is like having a burden lifted off my shoulders. 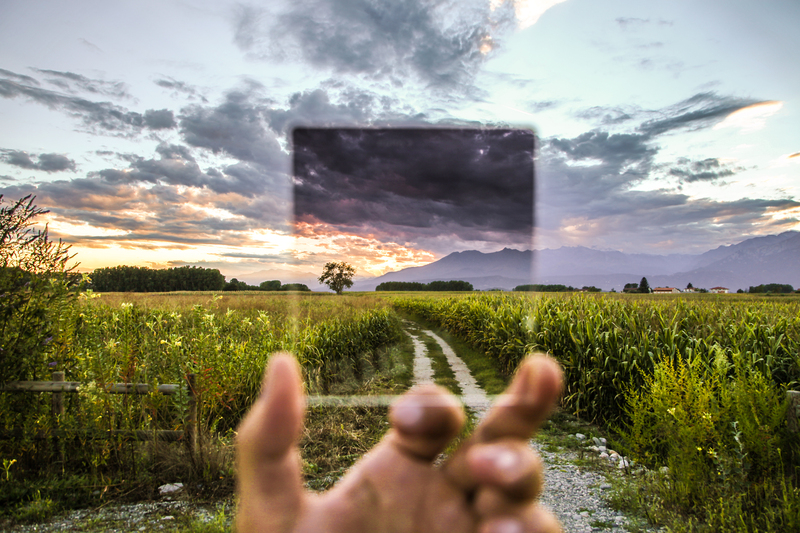 In what ways do you need to change your perspective? Have you ever rolled out of bed, stumbled down the stairs, and looked around at your messy house filled with toys that you didn’t feel like putting away last night, knowing it’s just another day and you probably still won’t get the toys put away? Besides never getting the toys put away, you still have to get the lunches made and the piano practice done and on and on and on and on…all within the next hour before you get kids off to school? I remember when I had this exact morning about 3 years ago, and I remember thinking – “gosh, this sure is fun – said no mom – ever.” But then my thoughts jumped to the fact that already two of my kids are in school all day and I only have one still at home with me. In a few years he will be at school all day as well – and once he is, then WHAT?? What would I do with my time all day long? Yes, for the first week I will eat bon bons and watch soaps all day. Actually, I don’t like either of those things, so I probably won’t do that. The quiet will be nice – but only for a couple days. I know myself well enough to know that I’ll go nuts if I don’t find something to keep me slightly stressed and busy. That’s how I roll – I function so much better on the edge of panic. It’s also how I get a lot done – I fill my days from sun up, to sun down with some type of work, and I tend to be very effective. 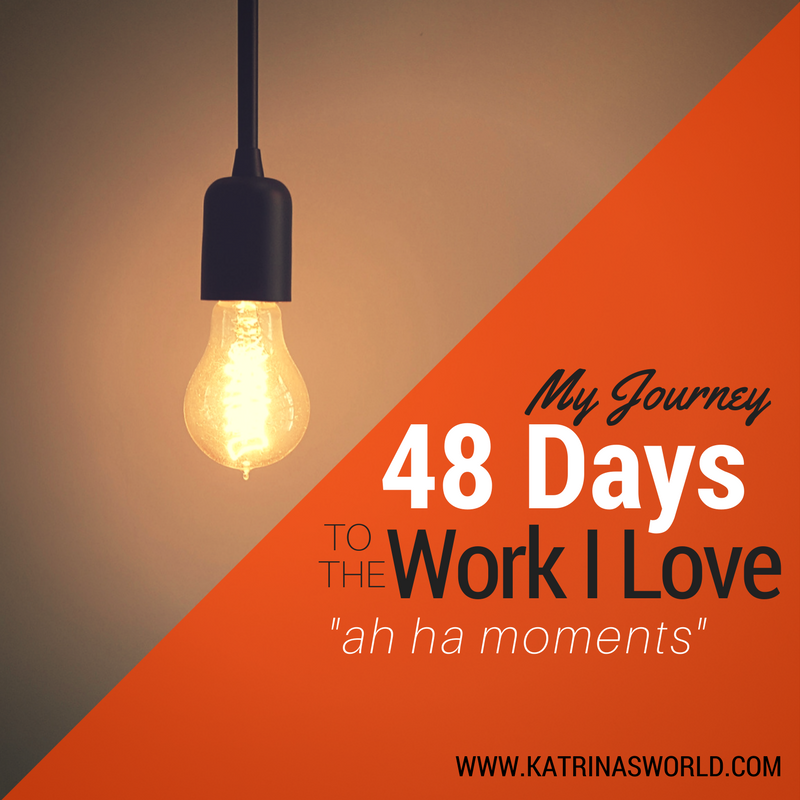 If I don’t have something to keep me actively busy and full of purpose, I will flounder. Since I know all of this about myself, and because I’m a planner, 3 years ago I started looking for things I could do to keep busy when all three kids will be in school full time. If you have read my blog for awhile now, you know I’m an entrepreneur at heart, so naturally, I began to think about business ideas and ways that I could earn and save money from home. After a lot of research and prayer, about a year ago I started actively working on a new business that I plan to work on full time when all three kids are in school, and I’m so excited! If you find yourself in the same place I did, wondering what you’ll do once kids are in school full time and wanting to make or save some money, then here are some ideas for you. I’ve also written a really great eBook, 5 Money-Making Ideas for Stay-At-Home-Moms, that you can download FREE now that explains many of these ideas and even a few more in detail. Shop at thrift and consignment stores. Don’t freak out – you really can find some amazing deals at thrift stores for your family and you can save a lot of money. Especially if you shop on their 50% off days! Yes, it takes some work to really look for stuff, and you tend to deal with long lines, but you can find some really great deals! Some of the best deals I’ve found have been on sporting equipment for the kids (especially on cleats) and maternity clothes. Sell your stuff at consignment stores. Not only should you shop at consignment stores, but you can sell your used stuff at them as well! I know some mommies who sell enough of their own stuff that they can then use their store credit to turn around and buy whatever they need, and are never really paying out of pocket for clothing! Use coupons every time you shop. Join a coupon group where you can share deals and swap coupons. Get your kids involved and have them help you clip coupons! If you get a system down, you can use coupons every week, save money, and not have it take up too much of your time. 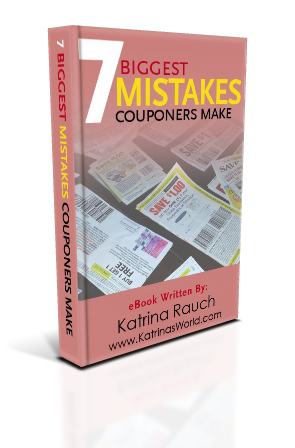 I explain a lot more about how to do this in another eBook I’ve written, 7 Biggest Mistakes Couponers Make – you might want to download that one as well. Have a garage sale. We all know this is a lot of work, but you can make quick money by having a garage sale! Start your own business! This is my favorite idea of all – I love to SAVE money, but I also love business and I personally want to earn money. 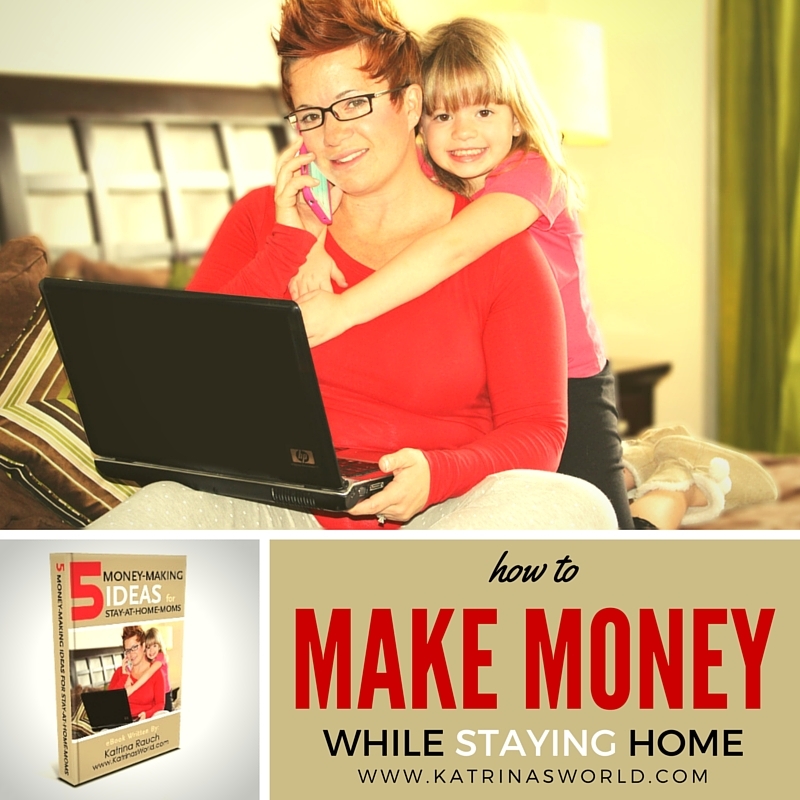 The best way I know to earn money from home is to start a network marketing business. There are so many of them to choose from with great products like jewelry, bags, makeup, energy drinks, etc! It’s all about finding one that fits your lifestyle and has the potential to earn the amount of income you are looking for. Some people just want the free stuff that you get from having a few parties, some people want to earn enough money to make the car payment, and some people want to find a business that replaces their spouse’s income. I was looking for a serious business model, with a company that had ground-breaking products that no one else offered, and that had the income potential to replace my spouse’s income and bring him back home to work with me in business again. I’m so happy because I’ve found it! Download my eBook for more ideas on how to save and earn money from home – it is possible! 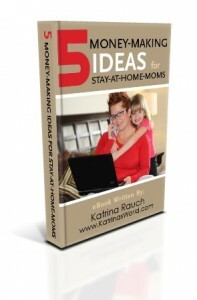 I’d love to hear your ideas on how you save your family money or how you make money at home! Please share them in the comments below! Hugs!